Aesop once told a story about how a crow used stones to raise the level of water in a jug. It's an interesting tale where the moral overshadows this interesting bit of information. People would think that it's just a fairy tale. Who would have thought that crows really knew how to use stones to raise the level of water in a container? But the fact is that crows (rooks) really do use this technique, and it may have been something crows have been doing for a very long time. Researchers have reported observing crow-relatives called rooks use the same rock technique to get to a worm floating on the water in a narrow container. Three of the birds were used in the experiment. 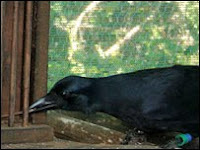 In previous experiments, crows and rooks have been shown to have used other tools like sticks (left). 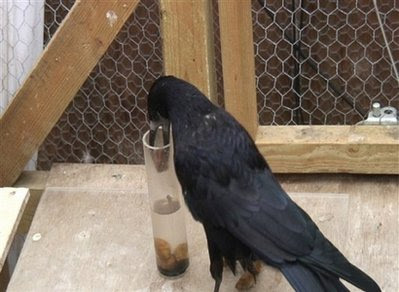 According to the scientists, the rooks appeared to get the idea that larger stones will do the trick faster. Christopher Bird of Cambridge University and fellow researchers used a six-inch tall plastic tube filled with water with a worm floating on top. Bird (the researcher, not the rook) noted that the rooks appeared to estimate how many stones were needed. It's something to think about and one reason why the term "bird-brained" shouldn't really mean "stupid" anymore. In Aesop's time, rooks were also called crows. Ever wonder why they were eventually called rooks? Perhaps they like to use rocks?